After installing Yii, you have a working Yii application that can be accessed via the URL http://hostname/basic/web/index.php or http://hostname/index.php, depending upon your configuration. This section will introduce the application's built-in functionality, how the code is organized, and how the application handles requests in general. Info: For simplicity, throughout this "Getting Started" tutorial, it's assumed that you have set basic/web as the document root of your Web server, and configured the URL for accessing your application to be http://hostname/index.php or something similar. For your needs, please adjust the URLs in our descriptions accordingly. Note that unlike framework itself, after project template is installed it's all yours. You're free to add or delete code and overall modify it as you need. and the "Login" page, which displays a login form that can be used to authenticate end users. Try logging in with "admin/admin", and you will find the "Login" main menu item will change to "Logout". These pages share a common header and footer. The header contains a main menu bar to allow navigation among different pages. You should also see a toolbar at the bottom of the browser window. This is a useful debugger tool provided by Yii to record and display a lot of debugging information, such as log messages, response statuses, the database queries run, and so on. Additionally to the web application, there is a console script called yii, which is located in the applications base directory. This script can be used to run background and maintenance tasks for the application, which are described in the Console Application Section. In general, the files in the application can be divided into two types: those under basic/web and those under other directories. The former can be directly accessed via HTTP (i.e., in a browser), while the latter can not and should not be. Yii implements the model-view-controller (MVC) architectural pattern, which is reflected in the above directory organization. The models directory contains all model classes, the views directory contains all view scripts, and the controllers directory contains all controller classes. 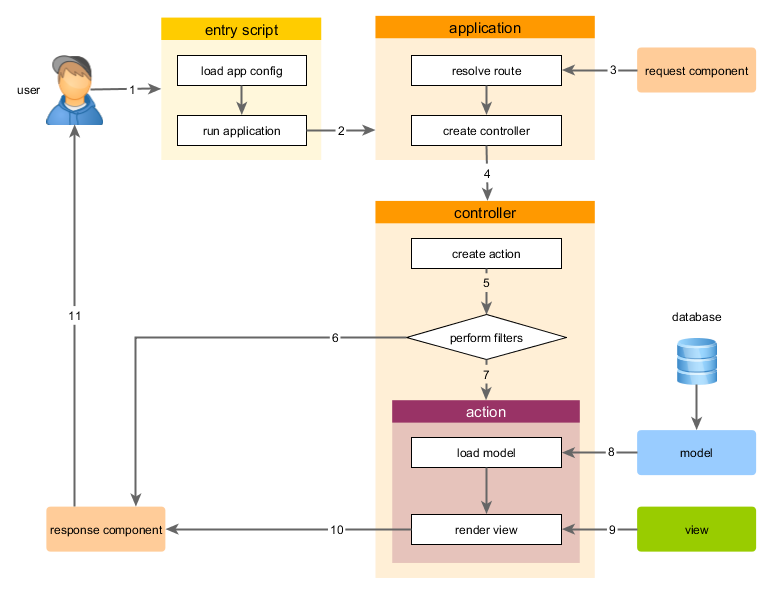 The following diagram shows the static structure of an application. Each application has an entry script web/index.php which is the only Web accessible PHP script in the application. The entry script takes an incoming request and creates an application instance to handle it. 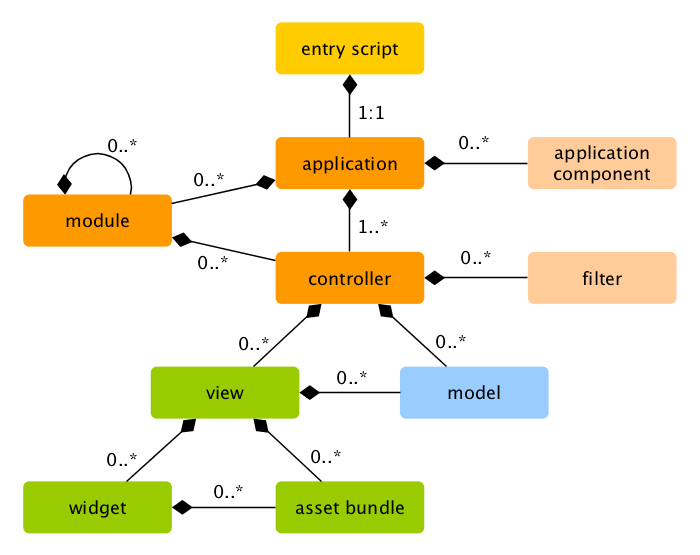 The application resolves the request with the help of its components, and dispatches the request to the MVC elements. Widgets are used in the views to help build complex and dynamic user interface elements.